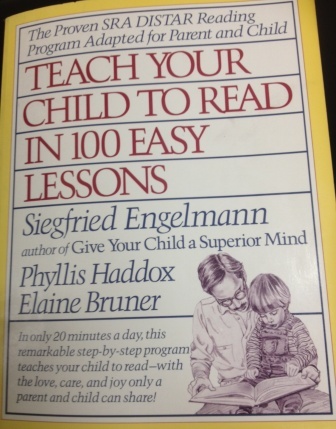 I’ve recently been trying to like the book Teach Your Child To Read In 100 Easy Lessons, co-authored by Direct Instruction guru Siegfried Engelmann. I bought this book years ago, but I confess I’ve never used it. Each lesson in the book contains scripts that the parent is intended to say verbatim, and it tells you precisely what to do (touch this, point to that etc.) every step of the way. The vowel is apparently meant to be pronounced as in the word “cat”, not as in the word “ha”. My problem: we don’t have “a” as in “cat” at the end of words in English. It’s a “checked” vowel and must be followed by a consonant. If the letter “a” is at the end of the word, the sound is usually “a” as in “Ma”, “Pa” and “tra la la”. 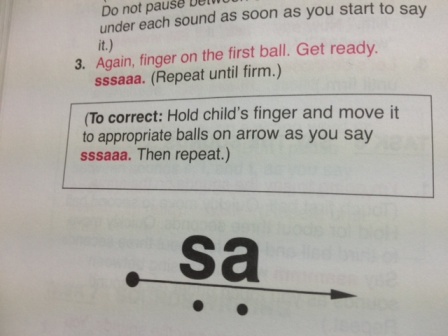 So I’m just not going to teach learners to say “sa” with “a” as in “cat”, sorry. It’s linguistically incorrect. Also, this book is from the US, where they say “r” after vowels. Here in Australia, we don’t, so I’m not going to teach those bits either. However, I know that this and other Direct Instruction programs are the ones that have had the best literacy results when tested by large-scale scientific blowtorches, so I’ve always felt a bit guilty about not using them. I have never been able to imagine getting my students to cooperate for long with these lessons, or wait around for me to check the script, if I hadn’t managed to memorise it before the session (it’s a long book, lesson 100 starts on page 389). I work with some pretty naughty and fed-up kids, and don’t have a lot of lesson-memorising time, and I’m sure you don’t either. As well as Teach Your Child to Read In 100 Easy Lessons, I’ve been looking at the Corrective Reading Word Attack Basics program, also co-authored by Engelmann. I’ve come to the conclusion that I use much the same logic and strategies, but that I need something that looks more interesting and meaningful, and sticks mostly to normal-looking text. As you can see from the photo above, the Word Attack Basics program also teaches some non-words, and while I think these are useful for testing purposes, I’m only interested in teaching real words. Most of my learners are already far enough behind on vocabulary, without wasting time learning words they won’t use. 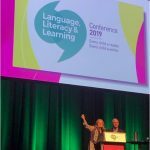 However, I recently went to the Learning Difficulties Australia Annual General Meeting and listened to a talk by Dr Rhonda Farkota about Direct Instruction, which included part of an old video clip of Siegfriend Engelmann asking a bunch of disadvantaged six-year-olds maths questions. 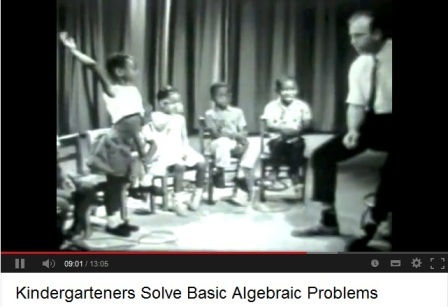 They knew an awful lot of maths for such little kids. I wish some of the much bigger kids I know were half as numerate. This video makes me laugh out loud in places. Engelmann behaves like a cross between a quiz show host and a call-and-response preacher. The kids sit forward on their chairs, shouting out answers, counting on their fingers and whispering workings-out to themselves under their breaths, and occasionally leaping to their feet to correct his errors on the board. They squeal, clap their hands and giggle. Don’t miss their answer to his question, “What happens when you think?”, at about minute 9. Priceless. This is not the dry, repetitive sort of teaching I imagined while reading “Teach Your Child To Read In 100 Easy Lessons”, but if this is how Direct Instruction is delivered, then I think the delivery is part of the secret. When I imagine Teach Your Child To Read In 100 Easy Lessons delivered at warp speed by a quiz show host-preacher-teacher, it doesn’t seem quite so dull and difficult after all. So if you’re a parent who isn’t confident about teaching your child to read, and the key things you want are a detailed script to follow plus the knowledge that your program has been scientifically tested, plus you’re prepared to set a cracking pace, overlook things like “sa” and adopt an American accent whenever you see a word-final “r”, “Teach Your Child To Read In 100 Easy Lessons” might be for you. 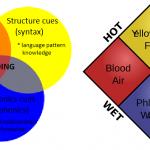 This entry was posted in books, curricula, phonics activities, reviews, teaching strategies on October 23, 2013 by alison. Teaching a child to read will be very beneficial to them in the future. Thanks for the information. 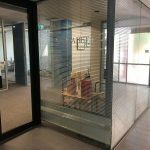 I’m fully aware of the type of results that have been achieved by Direct Instruction guru Siegfried Engelmann but I think we ought to be looking at why this might be. 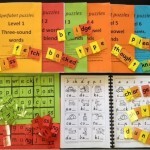 Explicit teaching (‘direct’ instruction) of phonics which teaches letters and letter groups as ‘code’ and which teaches the skill of blending will work across various phonics programmes. But, the example in the video you flag up is in danger of being misleading of just what is possible for a number of reasons. Firstly, the child in the video is really struggling with blending. This would be an example of a child perhaps with reading difficulties as his blending skill is looking like he is struggling. If he is struggling, that might also explain why it takes him mother some time to get his attention and he starts off by being a bit wriggly and disinterested. His mother has to keep up a lot of encouragement and praise to keep him on task. The hole in my own provision to inform parents and teachers about ‘just what we can achieve through good phonics provision’ is video footage and I’m working on that now – as are others with different phonics programmes but we understand ‘just what is possible and likely’ and it is beyond what we see on this video clip you have flagged up. 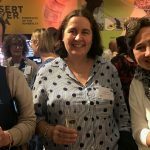 Although the use of diacritics (marks added to letters) and ‘sound buttons’ are part of the Direct Instruction practice which is shown by statistics to be successful, I suggest that we can achieve remarkable success with children without diacritics. Again, I need to flag this up with video footage to demonstrate this. We also, I suggest, do not need ‘sound buttons’ in order to get children decoding well and fluently. The letters and letter groups, taught ‘discretely’ (separately) ARE, in effect, the ‘sound buttons’. 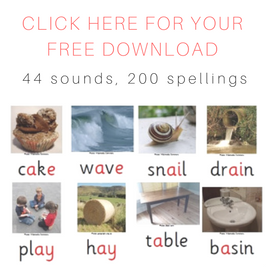 You point under the letter or letter group, and say the sound – teach children to recognise letters and letter groups in words before they are asked to ‘sound out’. 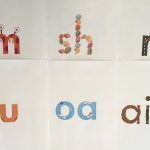 In the footage, I note that double consonant letters such as ss have two dots beneath – this would not be a feature of a number of good phonics programmes even if they do use the added ‘sound buttons’. They would put one dot, or a line, under the double ss. 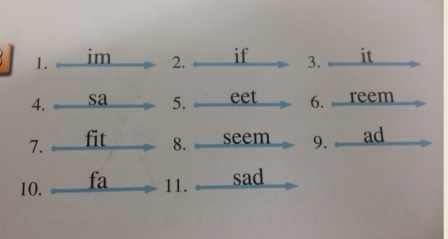 Further, I note that instead of treating the letter group ee as code for the sound /ee/ as in ‘tree’, again, there are two dots beneath and the diacritic lines – one above each letter e. So, the child is being taught to look for, or depend on, the lines above each single vowel letter to indicate the need to say the sound /ee/ rather than teaching the child to ‘note’ the letter group ee and then say the sound /ee/ in response. So, what happens when the diacritic marks are no longer supporting the child? 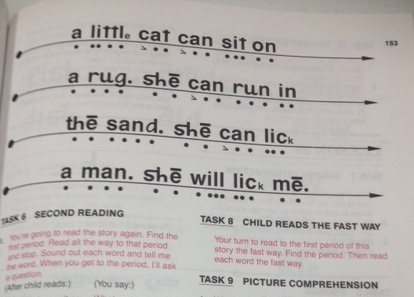 And what happens when the child is presented with ordinary text without diacritic marks? I am sure many, perhaps most, children find no difficulty in the transition from saying sounds supported by diacritic marks to saying sounds in response to ordinary text – but I really raise the question as to whether such marks are necessary in the first place – and whether, in some cases, it necessitates transition that is an extra step to ‘unlearn’? At no time am I questioning the results achieved by Direct Instruction, but I am questioning whether equal results (and perhaps better still) can be achieved through features in common with Direct Instruction (such as the explicit teaching, the scripting to support the adult, the sheer fact it is ‘phonics’ and applying the phonics skill of sounding out through the word – the ‘blending’ or ‘synthesising’ skill). With your linguistic phonics background and knowledge, I wouldn’t be surprised if you, too, think along similar lines to me. Right then, the onus is on me, and others, to provide footage to inform parents and teachers of what can be achieved without diacritic support! Yes, I think the advice from Diane McGuinness to not teach anything that you’ll discard later is spot on. I have dots separating syllables in my multisyllable workbooks but I’m planning to take them out in the next version, kids have to learn to “see” syllable boundaries without such assistance. I saw this book was popular and had great reports of great results so decided to buy it. I am teaching my 4.5-year-old using this book. I have to say that I am impressed with how quickly he’s progressing, although I have no other materials or children to compare it to. Having said that, I wouldn’t recommend it. We are up to lesson 40 and I have just skipped ahead to check what’s coming up and noted some serious pronunciation issues. Using the diacritics of the book “ōld”, “cōld”, “cōat” and “gōat” all have the same “ō” sound (the same as that in “coat”). In some parts of the USA that would be the case, but not in most parts of the English-speaking world, and definitely not here in Australia. So I’m 40 lessons in, my son is used to the teaching process in this book and is doing great, and now I’m faced with the decision of whether to go through the book and correct all the pronunciation mistakes, and to switch teaching materials. Not ideal!